B&K Precision today announced the expansion of its current 878B and 879B 40,000-count handheld LCR meters with the addition of a new 100 kHz model, the 880. This new portable LCR meter can measure inductance, capacitance, and resistance with 0.1% basic impedance accuracy. Offering many features typically found only in bench LCR meters, the 880 provides test frequencies up to 100 kHz, selectable test signal levels, and 4-terminal measurement capabilities. With a fast auto ranging function, convenient single-push auto detect mode, and versatile functions such as data recording, tolerance sorting, and relative mode, the 880 is suitable for characterizing components in the field or laboratory environments. Four-terminal shielded configurations can help minimize measurement errors and improve measurement accuracy. Using 4-terminal Kelvin test leads can help mitigate the effect of lead impedances and contact resistances. The 880 offers a 4-terminal socket with separate sensing and current leads plus a guard terminal. The 880 features a dual display with 40,000-count and 10,000-count resolution for primary and secondary measurements, respectively. Selectable test frequencies include 100 Hz, 120 Hz, 1 kHz, 10 kHz, and 100 kHz along with selectable test levels of 0.3 Vrms, 0.6 Vrms, and 1 Vrms. 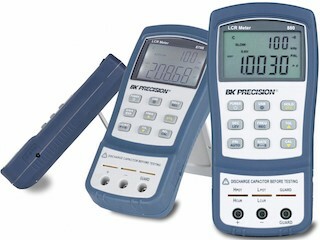 In addition, the LCR meter provides DC resistance measurement capability. Whereas many manufacturers of LCR meters typically only include a few accessories as standard, 880 users can expect a full set of useful accessories supplied with the instrument. Standard accessories include an AC adapter with rechargeable 9 V battery, mini USB cable, shorting plate, banana-to-alligator test leads, Kelvin clip test leads, and additional tweezer accessory for convenient measurement of SMD components. Available immediately, B&K Precision's 880 100 kHz handheld LCR meter comes with a 3-year warranty and is listed at a price of $399. For more than 60 years, B&K Precision Corporation has been building a reputation for excellence in the design and manufacture of reliable and cost-effective test and measurement instruments. The company’s products are used in a wide range of applications including design, research and development, production line testing, industrial maintenance, and electronic field service. B&K Precision test and measurement instruments are standard equipment in a large number of universities and technical schools which train future engineers and technicians. B&K Precision was founded in 1951 and is headquartered in Yorba Linda, California.